Two summers ago at Twitter Math Camp 14, I saw Dylan Kane (@math8_teacher) present a “My Favorite” about a problem he had enjoyed pondering during his summer adventures. You can read his post about it on his blog here. I believe the original problem came from the Five Triangles blog (which is now password protected. 😦 ) Given three “lined up” congruent equilateral triangles, each with area 20 cm^2, what is the area of the shaded region? Dylan was using the problem to tell a story, but I couldn’t help myself and immediately started sketching out ideas for solutions. If you’ve been to TMC, you know the sheer volume of good ideas, interactions with rockstar teachers, and mathy things to ponder is overwhelming, so after my initial attempt at a solution I got distracted and set the problem aside for the rest of the conference. Once I finished driving home from Jenks, the first thing I did that night was sit down and start thinking about the problem again. I told my sister Lindsey about it and she got in on the fun too. Here we are, lounging in my room past midnight doodling triangles and getting stumped. The week got busy as preparations for the 2014-2015 school year got underway, and I think I forgot about the problem for a bit. Lucky for me, I mentioned the problem to Dawson over brunch one Sunday, and by mid-afternoon he was texting me about his solution. did you do it in terms of 60 units sq? okay let’s chat later about methods. i’m relieved we got the same thing though! Rachel: what did you get for 4, 5? did you do it in terms of 20 sq units per triangle? or just proportion of one whole triangle? (2n-1) / 6 * area of 1 triangle?? Dawson: Did you look at each individual small triangle? What’s the area of each individual part? Rachel: when you look at the individual pieces is there something pretty? Dawson: You bet…I needed a long time!! Rachel: holy cow what is going on??? so 4 triangles is 9/12+4/12+1/12??? and those are triangular numbers on the denom?? Our text conversation turned into an email thread that included Dylan, Justin Lanier (@j_lanier), Nathan Kraft (@nathankraft1), Glenn Waddell (@gwaddellnvhs), Mimi Yang, Mark Greenaway, Jed Butler (@MathButler), and Tina Cardone (@crstn85), all of whom sent out their own version of the solution. It’s completely fascinating to me how many different approaches people took. People employed so many different strategies from using similar triangles and scale factor of sides/area, using ratios of sides in special right triangles and the formula for area of a triangle, writing equations of lines and finding points of intersection, to using trig and law of sines. 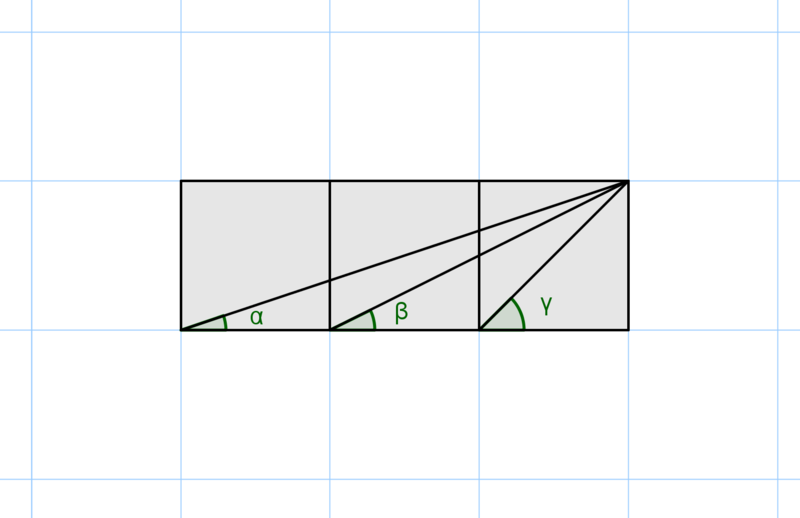 Several folks tackled the extension Dawson prompted above, and some worked on generalizing the problem for congruent isosceles triangles, or even congruent scalene triangles. One last thing: I used this problem as a “warm up” problem in a math department meeting a few months ago. One of my colleagues emailed me with his solution after the meeting, along with what might be my favorite quote in recent memory. Nice! I think I have seen that angles problem before, but had forgotten it. I’ll definitely give it a try. Now finally looking at the solutions you showed above its very nice to see a few different methods! neat! Now I want to dig into that extension where you go towards other lengths.